"LTFC" redirects here. For other uses, see LTFC (disambiguation). Luton Town Football Club /ˈluːtən ˈtaʊn/ is a professional association football club based since 1905 at Kenilworth Road, Luton, Bedfordshire. Founded in 1885, it is nicknamed "the Hatters" and affiliated to the Bedfordshire County Football Association. Its first-team is contesting the fourth tier of English football, League Two, during the 2016–17 season. The club's history includes major trophy wins, several financial crises, numerous promotions and relegations, and some spells of sustained success. It was perhaps most prominent between 1982 and 1992, when it was a member of English football's top division, at that time the First Division; the team won its only major honour, the Football League Cup, in 1988. The club was the first in southern England to turn professional, making payments to players as early as 1890 and turning fully professional a year later. It joined the Football League before the 1897–98 season, left in 1900 because of financial problems, and rejoined in 1920. Luton reached the First Division in 1955–56 and contested a major final for the first time when playing Nottingham Forest in the 1959 FA Cup Final. The team was then relegated from the top division in 1959–60, and demoted twice more in the following five years, playing in the Fourth Division from the 1965–66 season. However, it was promoted back to the top level by 1974–75. Luton Town's most recent successful period began in 1981–82, when the club won the Second Division, and thereby gained promotion to the First. Luton defeated Arsenal 3–2 in the 1988 Football League Cup Final and remained in the First Division until relegation at the end of the 1991–92 season. Between 2007 and 2009, financial difficulties caused the club to fall from the second tier of English football to the fifth in successive seasons. 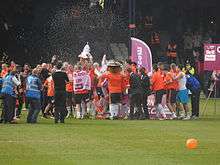 The last of these relegations came during the 2008–09 season, when 30 points were docked from Luton's record for various financial irregularities. Luton thereafter spent five seasons in non-League football before winning the Conference Premier in 2013–14, securing promotion back into the Football League. For more details on this topic, see History of Luton Town F.C. 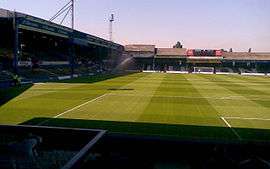 (1885–1970) and History of Luton Town F.C. (1970–present). Luton Town Football Club was formed on 11 April 1885, the product of a merger of the two leading local teams, Luton Town Wanderers and Excelsior. Initially based at Excelsior's Dallow Lane ground, the club began making payments to certain individual players in 1890. The following year, Luton became the first club in southern England to be fully professional. The club was a founder member of the Southern Football League in the 1894–95 season and finished as runners-up in its first two seasons. It then left to help form the United League and came second in that league's inaugural season before joining the Football League (then based mostly in northern and central England[A]) for 1897–98, concurrently moving to a new ground at Dunstable Road. The club continued to enter a team to the United League for two more seasons, and won the title in 1897–98. Poor attendance, high wages and the high travel and accommodation costs that resulted from Luton's distance from the northern heartlands of the Football League crippled the club financially, and made it too expensive to compete in that league. A return to the Southern League was therefore arranged for the 1900–01 season. Eight years after arriving at Dunstable Road, Luton moved again, settling at their current ground, Kenilworth Road, in 1905. Captain and left winger Bob Hawkes became Luton's first international player when he was picked to play for England against Ireland on 16 February 1907. A poor 1911–12 season saw Luton relegated to the Southern League's Second Division; the club won promotion back two years later. After the First World War broke out, Luton took part in The London Combination during 1915–16, and afterwards filled each season with friendly matches. A key player of the period was Ernie Simms, a forward. Simms was invalided back to England after being wounded on the Italian front, but recovered enough to regain his place in the Luton team and scored 40 goals during the 1916–17 season. The Luton side first played in the white and black colours which it has retained for much of its history during the 1920–21 season, when the club rejoined the Football League; the players had previously worn an assortment of colour combinations, most permanently sky blue shirts with white shorts and navy socks. Such was the quality of Luton's team at this time that despite playing in the third tier, a fixture between Ireland and England at Windsor Park on 22 October 1921 saw three Luton players on the pitch—Louis Bookman and Allan Mathieson for Ireland, and the club's top goalscorer, Simms, for England. However, after Luton finished fourth in the division, the squad was broken up as Simms, Bookman and Mathieson joined South Shields, Port Vale and Exeter City respectively. Luton stayed in the Third Division South until 1936–37, when the team finished top and won promotion to the Second Division, at that time the second tier of English football. During the promotion season, striker Joe Payne scored 55 goals in 39 games; during the previous season he had scored 10 in one match against Bristol Rovers, which remains a Football League record today. During the early 1950s, one of Luton's greatest sides emerged under manager Dally Duncan. The team included Gordon Turner, who went on to become Luton's all-time top goalscorer, Bob Morton, who holds the record for the most club appearances, and Syd Owen, an England international. During this period, Luton sides also featured two England international goalkeepers, Ron Baynham and Bernard Streten, as well as Irish internationals Seamus Dunne, Tom Aherne and George Cummins. This team reached the top flight for the first time in 1955–56, after finishing the season in second place behind Birmingham City on goal average. A few years of success followed, including an FA Cup Final appearance against Nottingham Forest in 1958–59; at the end of the season, Owen was voted FWA Footballer of the Year. However, the club was relegated the following season and, by 1964–65, was playing in the fourth tier. In yo-yo club fashion, Luton were to return. A team including Bruce Rioch, John Moore and Graham French won the Fourth Division championship in 1967–68 under the leadership of former player Allan Brown; two years later Malcolm Macdonald's goals helped them to another promotion, while comedian Eric Morecambe became a director of the club. Luton Town won promotion back to the First Division in 1973–74, but were relegated the following season by a solitary point. Former Luton player David Pleat was made manager in 1978, and by 1982–83 the team was back in the top flight. The team which Pleat assembled at Kenilworth Road was notable at the time for the number of black players it included; during an era when many English squads were almost entirely white, Luton often fielded a mostly black team. Talented players such as Ricky Hill, Brian Stein and Emeka Nwajiobi made key contributions to the club's success during this period, causing it to accrue "a richer history of black stars than any in the country", in the words of journalist Gavin Willacy. On the last day of the 1982–83 season, the club's first back in the top tier, it narrowly escaped relegation: playing Manchester City at Maine Road, Luton needed to win to stay up, while City could escape with a draw. A late winner by Yugoslavian substitute Raddy Antić saved the team and prompted Pleat to dance across the pitch performing a "jig of joy", an image that has become iconic. The club achieved its highest ever league position, seventh, under John Moore in 1986–87, and, managed by Ray Harford, won the Football League Cup a year later with a 3–2 win over Arsenal. With ten minutes left on the clock and Arsenal 2–1 ahead, a penalty save from stand-in goalkeeper Andy Dibble sparked a late Luton rally: Danny Wilson equalised, before Brian Stein scored the winner with the last kick of the match. The club reached the League Cup Final once more in 1988–89, but lost 3–1 to Nottingham Forest. The club was relegated from the top division at the end of the 1991–92 season, and sank to the third tier four years later. Luton stayed in the third-tier Second Division until relegation at the end of the 2000–01 season. Under the management of Joe Kinnear, who had arrived halfway through the previous season, the team won promotion from the fourth tier at the first attempt. "Controversial" owner John Gurney unsettled the club in 2003, terminating Kinnear's contract on his arrival in May; Gurney replaced Kinnear with Mike Newell before leaving Luton as the club entered administration. Newell's team finished as champions of the rebranded third-tier Football League One in 2004–05. While Newell's place was taken first by Kevin Blackwell and later former player Mick Harford, the team was then relegated twice in a row, starting in 2006–07, and spent the latter part of the 2007–08 season in administration, thus incurring a ten-point deduction from that season's total. The club then had a total of 30 points docked from its 2008–09 record by the Football Association and the Football League for financial irregularities dating back several years. These deductions proved to be too large an obstacle to overcome, but Luton came from behind in the final of the Football League Trophy to win the competition for the first time. Relegation meant that 2009–10 saw Luton playing in the Conference Premier, a competition which the club had never before participated in. The club unsuccessfully contested the promotion play-offs three times in four seasons during their time as a non-League club, employing five different managers. In the 2012–13 FA Cup fourth round, Luton won their away tie against Premier League club Norwich City 1–0 and, in doing so, became the first non-League team to beat a side from England's top division since 1989. In the 2013–14 season, under the management of John Still, Luton won the Conference Premier championship with three games to spare, and thereby secured a return to the Football League from 2014–15. Luton first wore white and black between 1920 and 1973. The club's nickname, "the Hatters", reflects Luton's historical connection with the hat making trade, which has been prominent there since the 17th century. The nickname was originally a variant on the now rarely seen straw-plaiters. Supporters of the club are also called Hatters. The club is associated with two very different colour schemes—white and black (first permanently adopted in 1920), and orange, navy and white (first used in 1973, and worn by the team as of the 2015–16 season). Luton mainly wore a combination of light blue and white before 1920, when white shirts and black shorts were first adopted. These colours were retained for over half a century, with the colour of the socks varying between white and black, until Luton changed to orange, navy and white at the start of the 1973–74 season. Luton began playing in white shirts, shorts and socks in 1979, with the orange and navy motif reduced to trim; navy shorts were adopted in 1984. This palette was retained until the 1999–2000 season, when the team played in orange shirts and blue shorts. From 2000 to 2008, Luton returned to white shirts and black shorts; orange was included as trim until 2007. The white, navy and orange palette favoured in the 1980s was brought back in 2008, following the results of a club poll, but a year later the colours were changed yet again, this time to a predominantly orange strip with white shorts. Navy shorts were readopted in 2011. Luton are wearing orange shirts, navy shorts and white socks during the 2015–16 season. Luton Town have traditionally used the town's crest as its own in a manner similar to many other teams. The club's first badge was a white eight-pointed star, which was emblazoned across the team's shirts (then a deep cochineal red) in 1892. Four years later a crest comprising the club's initials intertwined was briefly adopted. The shirts were thereafter plain until 1933, when Luton first adopted a badge depicting a straw boater, which appeared on Luton shirts. The letters "LTFC" were added in 1935, and this basic design remained until 1947. The club then played without a badge until 1970, when the club began to wear the town crest regularly, having first done so in the 1959 FA Cup Final. In 1973, concurrently with the club's switch to the orange kit, a new badge was introduced featuring the new colours. The new emblem depicted a stylised orange football, bearing the letters "Lt", surrounded by the club's name in navy blue text. In 1987, the club switched back to a derivative of the town emblem, with the shield portion of the heraldic crest becoming the team's badge; the only similarity with the previous design was the inclusion of the club name around the shield in navy blue. The "rainbow" badge, introduced in 1994, featured the town crest below an orange and blue bow which curved around to meet two footballs, positioned on either side of the shield, with the club name underneath. This badge was used until 2005, when a replacement very similar to the 1987 version was adopted, featuring black text rather than blue and a straw boater in place of the outstretched arm depicted in the older design. The club's founding year, 1885, was added in 2008. The badge was altered once more during the 2009–10 pre-season, with the red of the town crest being replaced with orange to better reflect the club colours. The first sponsor to appear on a Luton Town shirt was Tricentrol, a local motor company based in Dunstable, who sponsored the club from March 1980 to 1982; the deal was worth £50,000. Subsequent sponsors have been Bedford Trucks (1982 to 1990), Vauxhall (1990 to 1991), Universal Salvage Auctions (1991 to 1999), SKF (1999 to 2003), Travel Extras (2003 to 2005), Electrolux (2005 to 2008), Carbrini Sportswear (2008 to 2009), and EasyJet and NICEIC (concurrently, 2009 to 2015). Since August 2015, the club's kit has been sponsored by NICEIC and the local education establishment Barnfield College. The club released the song "Hatters, Hatters", a collaboration between the Luton team and the Bedfordshire-based musical comedy group the Barron Knights, in 1974. Eight years later another song featuring vocals by the Luton players, "We're Luton Town", was released to celebrate the club's promotion to the First Division. The view from the Kenilworth End in 2007. To the left is the Main Stand, and to the right is the Oak Road End. Luton Town's average home league attendances at Kenilworth Road from 1946–47 to 2007–08. Attendances rose with Luton's promotion in 1955 before plummeting during the early 1960s as the club suffered three relegations. Spectators returned with the promotions of the late 1960s. Luton Town's first ground was at Dallow Lane, the former ground of Excelsior. The ground was next to the Dunstable to Luton train line, and players regularly claimed to have trouble seeing the ball because of smoke from the trains. A damaging financial loss during 1896–97 forced Luton to sell the stadium to stay afloat and, as a result, the club moved across the tracks to a stadium between the railway and Dunstable Road. The Dunstable Road ground was opened by Herbrand Russell, 11th Duke of Bedford, who also donated £50 towards the £800 building costs. When the site was sold for housing in 1905, the club was forced to move again at short notice, to its present Kenilworth Road site, in time for the start of the 1905–06 season. The 10,356 capacity all-seater stadium is in the Bury Park area of Luton, and named after the road that runs along one end of it, although the official address of the club is 1 Maple Road. Opposite the eponymous Kenilworth Stand is the Oak Road End, which has evolved from a stand first used exclusively by Luton supporters, then later by away supporters, and now used by both except in times of high ticket demand from away clubs. The Main Stand is flanked by the David Preece Stand, and opposite them stands a row of executive boxes. These boxes replaced the Bobbers Stand in 1986, as the club sought to maximise income. The original Main Stand burnt down in 1921, and was replaced by the current stand before the 1922–23 campaign. The ground underwent extensive redevelopment during the 1930s, and the capacity by the start of the Second World War was 30,000. Floodlights were installed before the 1953–54 season, but it was 20 years before any further modernisation was carried out. In 1973 the Bobbers Stand became all-seated, and in 1985 the grass pitch was replaced with an artificial playing surface; it quickly became unpopular and was derided as "the plastic pitch". A serious incident involving hooliganism before, during and after a match against Millwall in 1985 caused the club's then chairman, Conservative MP David Evans, to introduce a scheme effective from the start of 1986–87 banning all visiting supporters from the ground, and requiring home fans to carry identity cards when attending matches. Conversion to an all-seater ground also began in 1986. Away fans returned for 1990–91, and grass a year later. The David Preece Stand was erected in 1991, and the conversion of the Kenilworth Stand to an all-seater was completed in 2005. The club first stated its intent to leave Kenilworth Road in 1955. Even then the ground was small compared to rival stadia, and its location made significant redevelopment difficult. The team has since made several attempts to relocate. Leaving Luton for the nearby new town of Milton Keynes was unsuccessfully proposed several times, most notably in the 1980s. The club sold Kenilworth Road to Luton Council in 1989, and has since leased it. A planning application for a new ground, the "Kohlerdome" proposed by chairman David Kohler in 1995, was turned down by the Secretary of State in 1998, and Kohler left soon after. In 2007, the club's then-owners proposed a controversial plan to relocate to a site near Junction 12 of the M1 motorway, near Harlington and Toddington. A planning application was made on the club's behalf by former chairman Cliff Bassett, but the application was withdrawn almost immediately following the club's takeover in 2008. In 2009, the club began an independent feasibility study to determine a viable location to move to. The club did not rule out redeveloping Kenilworth Road and, in October 2012, entered talks to buy the stadium back from Luton Borough Council. By 2015 these plans had been dropped in favour of a move to a new location, with Managing Director Gary Sweet confirming that the club was in a position to "buy land, secure the best possible professional advice... and to see the [planning] application process through to the receipt of consent." In April 2016 the club announced its intention to build and move into a 17,500-capacity stadium on the Power Court site in central Luton. During the 2014–15 season, Luton Town had an average home league attendance of 8,702—the second highest in League Two behind only Portsmouth. [B] In the 2013–14 season, when the club were in the Conference Premier, the club had significantly higher support than the other clubs in its league, with an average home attendance of 7,387; more than twice compared to the second highest of 3,568. [C] Average attendances at Kenilworth Road fell with the installation of seats and the club's reduction in stature, dropping from 13,452 in 1982–83 to their 2014–15 level—a slump of 35% over 32 years. A supporters' trust, Trust in Luton, owns shares in the club and elects a representative to the club's board. The club's official supporters' group, Luton Town Supporters' Club, merged with Trust in Luton in 2014. The club is associated with another supporters' group, the breakaway Loyal Luton Supporters Club. Trust in Luton has, since March 2014, held the legal right to veto any changes to the club's identity, including name, nickname, colours, club crest and mascot. Luton Town supporters maintain a bitter rivalry with Hertfordshire-based Watford. Watford have remained the higher ranked team at the end of every season since 1997. However, overall Luton still hold the superior record in the fixture between the two clubs; out of 118 competitive matches there have been 53 Luton victories and 36 for Watford, with 29 draws. A survey taken in 2003 showed that there was also animosity between Luton Town fans and those of west London club Queens Park Rangers. The club produces an official match programme for home games, Talk of the Town. A character known as Happy Harry, a smiling man wearing a straw boater, serves as the team's mascot and appears on the Kenilworth Road pitch before matches. In December 2014, after the seafront statue of Eric Morecambe in his birthplace Morecambe was restored, Luton and Morecambe F.C. jointly announced that the winners of future Luton–Morecambe fixtures would be awarded the "Eric Morecambe Trophy". The record for the most appearances for Luton is held by Bob Morton, who turned out for Luton 562 times in all competitions. Morton also holds the record for the most Football League appearances for the club, with 495. Fred Hawkes holds the record for the most league appearances for Luton, having played in 509 league matches. Six players, Gordon Turner, Andy Rennie, Brian Stein, Ernie Simms, Herbert Moody and Steve Howard, have scored more than 100 goals for Luton. The first player to be capped while playing for Luton was left winger Robert Hawkes, who took to the field for England against Ireland at Goodison Park on 16 February 1907. The most capped player is Mal Donaghy, who earned 58 Northern Ireland caps while at the club. The first player to score in an international match was Joe Payne, who scored twice in his only game for England against Finland on 20 May 1937. Payne also holds the Football League record for the most goals in a game—he hit 10 past Bristol Rovers on 13 April 1936. The club's largest wins have been a 15–0 victory over Great Yarmouth Town on 21 November 1914 in the FA Cup and a 12–0 win over Bristol Rovers in the Third Division South on 13 April 1936. Luton's heaviest loss was a 9–0 defeat against Small Heath in the Second Division on 12 November 1898. Luton's highest home attendances are 30,069 against Blackpool in the FA Cup on 4 March 1959 and 27,911 against Wolverhampton Wanderers in the First Division on 5 November 1955. The highest transfer fee received for a Luton Town player is the £3 million West Bromwich Albion paid for Curtis Davies on 31 August 2005. The most expensive player Luton Town have ever bought was Lars Elstrup, who cost £850,000 from Odense Boldklub on 21 August 1989. The youngest player to make a first-team appearance for Luton Town is Connor Tomlinson at 15 years and 199 days old in the EFL Trophy, replacing Zane Banton as a 92nd-minute substitute in a 2–1 win over Gillingham on 30 August 2016, after the club were given permission for him to play from his headteacher. As of 2 December 2016. The club operates a Development Squad, made up of contracted senior players, youth team scholars and trialists, which plays in the Southern Division of The Central League. The club also fields an under-18 team in the Football League Youth Alliance South East Conference. Luton's youth set-up consists of ten Soccer Centres across Bedfordshire and North Hertfordshire, two Centres of Excellence (one in Luton, one in Dunstable), and an Academy in Baldock that caters for players in the under-9 to under-16 age groups. 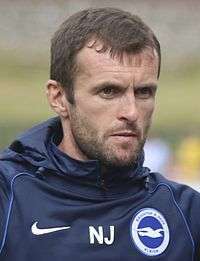 Nathan Jones, Luton's current manager, seen in 2014. 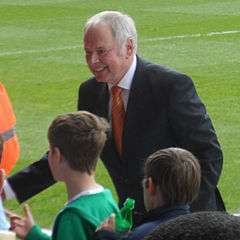 Nick Owen, the club chairman, talking to fans before a home game in 2014. As of 26 July 2016. 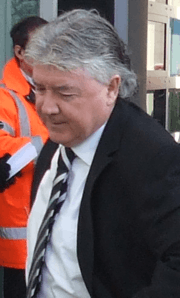 Joe Kinnear, seen in 2009, was Luton manager from 2001 to 2003. Richard Money (2007 photograph), a player for Luton during the 1982–83 season, managed the club from 2009 to 2011. As of 17 December 2015. Only managers in charge for a minimum of 50 competitive matches are counted. Luton Town's major honours are detailed below; non-League achievements are omitted. For a list of all club honours, including those won outside the Football League, see List of Luton Town F.C. records and statistics : Honours and achievements. A. ^ The only other club from the south of England in the Football League at the time was Woolwich Arsenal. B. ^ Calculated by adding together all the home league attendances for the 2014–15 season to calculate the total attendance (200,157) and then dividing by the number of home league matches (23) to reach an average of 8,702. Attendances taken from BBC report for match that day and Soccerbase statistics. C. ^ Calculated by adding together all the home league attendances for the 2013–14 season to calculate the total attendance (169,906) and then dividing by the number of home league matches (23) to reach an average of 7,387. Attendances taken from BBC report for match that day and Soccerbase statistics. D. ^ Before the start of the 2004–05 season, Football League re-branding saw the First Division become the Football League Championship. The Second and Third Divisions became Leagues One and Two, respectively. E. ^ On its formation for the 1992–93 season, the FA Premier League became the top tier of English football; the First, Second and Third Divisions then became the second, third and fourth tiers, respectively. ↑ "Luton Town's Official Matchday Programme". lutontown. Luton Town F.C. 14 April 2007. ↑ "Saturday Ticket Update: 130 New Seats Installed!". Luton Town F.C. 15 August 2014. Retrieved 16 August 2014. ↑ "Company details". Luton Town F.C. 28 November 2008. Retrieved 7 August 2011. ↑ Collings (1985). The Luton Town Story 1885–1985. pp. 1–2. 1 2 3 Hayes (2002). Completely Top Hatters!. p. 55. 1 2 3 Collings (1985). The Luton Town Story 1885–1985. pp. 3–4. 1 2 3 4 5 6 7 8 9 10 11 12 13 14 15 Rundle, Richard. 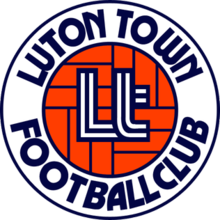 "Football Club History Database – Luton Town". Football Club History Database. Archived from the original on 29 May 2008. Retrieved 29 April 2009. 1 2 3 4 5 6 Hayes (2002). Completely Top Hatters!. p. 43. 1 2 3 4 Collings (1985). The Luton Town Story 1885–1985. pp. 11–13. 1 2 "England 1 – Ireland 0". England Stats. Retrieved 10 April 2009. 1 2 3 Hayes (2002). Completely Top Hatters!. p. 156. ↑ Collings (1985). The Luton Town Story 1885–1985. pp. 22–26. 1 2 Bailey (1997). The Definitive Luton Town F.C. p. 8. ↑ Collings (1985). The Luton Town Story 1885–1985. pp. 26–27. 1 2 3 4 Moor, Dave. "Luton Town". Historical Football Kits. Retrieved 26 April 2014. ↑ Courtney, Barrie (21 March 2004). "England – International Results 1920–1929 – Details". Rec.Sport.Soccer Statistics Foundation (RSSSF). Retrieved 22 March 2012. 1 2 3 Collings (1985). The Luton Town Story 1885–1985. p. 27. ↑ Bailey (1997). The Definitive Luton Town F.C. pp. 92–97. ↑ Collings (1985). The Luton Town Story 1885–1985. pp. 46–50. ↑ Collings (1985). The Luton Town Story 1885–1985. pp. 74–75. ↑ Hayes (2002). Completely Top Hatters!. p. 41. ↑ Hayes (2002). Completely Top Hatters!. pp. 176–177. ↑ Hayes (2002). Completely Top Hatters!. pp. 114–115. ↑ Hayes (2002). Completely Top Hatters!. p. 130. ↑ Hayes (2002). Completely Top Hatters!. pp. 10–11. ↑ Hayes (2002). Completely Top Hatters!. p. 168. ↑ Hayes (2002). Completely Top Hatters!. pp. 41–42. ↑ Hayes (2002). Completely Top Hatters!. pp. 1–2. ↑ Hayes (2002). Completely Top Hatters!. p. 31. 1 2 Collings (1985). The Luton Town Story 1885–1985. pp. 70–74. ↑ Collings (1985). The Luton Town Story 1885–1985. pp. 78–82. ↑ "England Player Honours – Football Writers' Association Footballers of the Year". England Football Online. 19 June 2007. Retrieved 13 May 2009. ↑ Collings (1985). The Luton Town Story 1885–1985. pp. 95–98. 1 2 Collings (1985). The Luton Town Story 1885–1985. pp. 108–111. ↑ "Luton Town 1974–1975 : Home". Statto. Retrieved 24 June 2009. ↑ Willacy, Gavin (October 2008). "Opportunity knocked". When Saturday Comes. London. Retrieved 8 March 2012. It is perhaps most alarming that Ramsey's bitterest experience of what he considered racism came at Luton Town, a club who have had probably more black players and a richer history of black stars than any in the country, but who maintain an almost exclusively white fan base. 1 2 Bevan, Chris (3 May 2003). "Classic matches at Maine Road". BBC. Retrieved 24 May 2009. ↑ "1974–1985". Luton Town F.C. 10 February 2005. Retrieved 24 June 2009. Visions of David Pleat skipping across the ... turf ... remain some of television's enduring images. ↑ "Luton Town 1986–1987 : Home". Statto. Retrieved 24 June 2009. 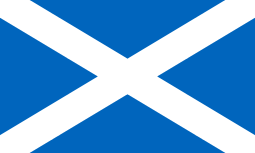 ↑ "1985–1988". Luton Town F.C. 24 May 2007. Retrieved 24 June 2009. A last-minute strike from Brian Stein saw [Luton] Town finally overcome Arsenal 3–2 at Wembley in a see-saw thriller in which Arsenal, leading 2–1, were awarded a penalty, which was brilliantly saved by Andy Dibble, before [Luton] Town came storming back, leading to skipper Steve Foster lifting the Littlewoods Cup. ↑ Lamont, Tom (6 April 2008). "Frozen in time ... Luton Town win the League Cup, 24 April 1988". The Observer. London: Guardian News and Media. Retrieved 24 June 2009. Arsenal led 2–1 with 10 minutes left when Andy Dibble, Luton's reserve keeper, saved a Nigel Winterburn penalty ... This equaliser was scrambled in [when] Brian [Stein] hit the ball across the face of the box. Danny Wilson nodded it in. In the final minute, Brian Stein's close-range volley snatched victory. ↑ "Winners and Losers". The Independent. London: Independent News & Media. 6 May 1996. Retrieved 13 May 2009. ↑ Haylett, Trevor (25 April 2001). "Rotherham on the rise as Luton fall" (reprint hosted at NewsBank). The Independent. London: Independent News & Media. Retrieved 22 March 2012. ↑ "Kinnear: I'm the boss". London: BBC Sport Online. 8 February 2001. Retrieved 22 March 2012. 1 2 3 4 "Trouble at the Top: Luton Kicks Off". BBC. 2 April 2007. Retrieved 25 June 2009. ↑ "Luton ponder Dons merger". London: BBC Sport. 9 May 2003. Retrieved 22 March 2012. ↑ "Luton pick Newell". The Daily Telegraph. London: Telegraph Media Group. 23 June 2003. Retrieved 13 May 2009. ↑ Brown, Geoff (1 May 2005). "Round-up : Coventry end with demolition Derby". The Independent. London: Independent News & Media. Retrieved 13 May 2009. ↑ "Luton Town appoint new manager". BBC. 2 April 2007. Retrieved 13 May 2009. ↑ Hodges, Vicki; Caroe, Charlie (16 January 2008). "Mick Harford replaces Kevin Blackwell at Luton". The Daily Telegraph. London: Telegraph Media Group. Retrieved 29 April 2009. ↑ "Luton Town 2006–2007 : Home". Statto. Retrieved 24 June 2009. ↑ "Luton lose appeal against points deduction". guardian.co.uk. London: Guardian News and Media. 15 July 2008. Retrieved 22 March 2012. ↑ "Luton 0–0 Chesterfield". BBC. 13 April 2009. Retrieved 13 April 2009. ↑ Fletcher, Paul (5 April 2009). "Luton 3–2 Scunthorpe (aet)". BBC. Retrieved 6 April 2009. ↑ Osborne, Chris (26 January 2013). "Norwich 0–1 Luton". BBC. Retrieved 26 January 2013. ↑ "Luton Town win Conference Premier and Football League spot". BBC Sport. 15 April 2014. Retrieved 17 April 2014. ↑ "A history hat making in Luton". Plaiting and Straw Hat Making. Luton Libraries. Retrieved 18 June 2008. ↑ "The Origins of Luton's Hat Industry". Plaiting and Straw Hat Making. Luton Libraries. Retrieved 19 May 2009. ↑ Hayes (2002). Completely Top Hatters!. p. 123. ↑ "One Day to Go!!". Luton Town F.C. Retrieved 10 October 2008. ↑ "Luton Town F.C. Home/Away" (PDF). Luton Town F.C. 27 July 2009. Retrieved 28 July 2009. 1 2 3 "The Badge". The Hatters: Passion and Pride since 1885. Luton: Luton Town F.C. 2011. p. 112. 1 2 "Revealed:The New Crest". Luton Town F.C. 28 July 2009. Retrieved 28 July 2009. ↑ "Luton sign £50,000 deal". Luton Town. Luton Town F.C. 1 March 1980. ↑ "Revealed:The New Sponsors". Luton Town F.C. 28 July 2009. Retrieved 28 July 2009. ↑ "Get the new look!". Luton Town F.C. 19 July 2013. Retrieved 25 July 2013. ↑ "Luton Town renew with EasyJet for Football League return". Soccerex. 25 June 2014. Retrieved 18 October 2014. ↑ "Barnfield College named as new Luton shirt sponsor". Luton Town F.C. 1 August 2015. Retrieved 4 August 2015. ↑ "Miranda Hart after Eric Impersonators". Luton Town F.C. 7 December 2012. Retrieved 28 October 2014. We're Luton Town (vinyl record). Luton Town Football Club. Artesian Records. 1982. ARC 314 A. ↑ "Britons who HATE Britain: The Muslim extremists hell-bent on segregation rather than integration". Daily Mail. 14 March 2009. Retrieved 26 March 2012. 1 2 3 4 "Kenilworth Stadium". Luton Town F.C. Retrieved 8 May 2009. ↑ "Unlucky Luton, a reminder of football's forgotten days". Liverpool Daily Post. Trinity Mirror North West & North Wales. 17 April 2009. Retrieved 8 May 2009. ↑ Lawton, Graham (4 June 2005). "Pitch battle over artificial grass". New Scientist (2502): 35. Retrieved 11 January 2008. ↑ Davies, Christopher (21 May 2004). "Millwall hopes to leave dark history behind in F.A. Cup final". The Japan Times. Retrieved 26 March 2008. ↑ "Luton may end its ban on supporters". The Times. Times Newspapers. 24 May 1990. ↑ "Uefa approves artificial pitches". BBC. 10 November 2004. Retrieved 26 March 2008. ↑ Rose, Neil (20 June 2005). "Luton Town 1 MK Dons 0". When Saturday Comes. Retrieved 11 April 2009. 1 2 "Luton Town FC in talks to buy back Kenilworth Road". BBC News. 1 October 2012. Retrieved 6 October 2012. ↑ Bose, Mihir (23 October 1994). "Luton chairman ready for a stretch inside". The Sunday Times. Times Newspapers: 22. ; "Lawrence counts cost of progress". The Sunday Times. Times Newspapers: 5 (Sport). 29 November 1998. ; "Luton's proposed stadium blocked". The Times. Times Newspapers: 49. 23 February 1999. ↑ "Luton stadium dream moves closer". BBC Sport. 15 February 2007. Retrieved 15 May 2016. ↑ Knowles, Keeley (30 March 2008). "J12 stadium plans run into problems". Luton On Sunday. Local World. Retrieved 15 May 2016. ↑ "Junction 12 application withdrawn". Luton Town F.C. 1 September 2008. Archived from the original on 16 April 2009. Retrieved 15 May 2016. ↑ "Luton stadium plan 'unaffordable'". BBC Sport. 23 February 2009. Retrieved 11 May 2009. ↑ "Chapter 9 – Action Areas". Luton Borough Council. Retrieved 11 May 2009. ↑ "Hatters' new stadium location to be revealed soon". Luton Today. Johnston Publishing Ltd. 19 April 2015. Retrieved 13 May 2015. ↑ "Nathan Jones: Luton Town's new stadium at Power Court 'not just generic'". BBC Sport. 22 April 2016. Retrieved 15 May 2016. ↑ Bailey (1997). The Definitive Luton Town F.C. p. 70. ↑ "Trust in Luton – Working with others". Loyal Luton Supporters Club. Retrieved 22 April 2009. ↑ "Trust in Luton". Trust in Luton. Archived from the original on 22 August 2008. Retrieved 11 May 2008. ↑ "Town fans get united!". Trust in Luton. 17 November 2014. Retrieved 29 May 2015. ↑ "Loyal Luton Supporters Club". Loyal Luton Supporters Club. Retrieved 11 May 2008. ↑ "Exclusive: Trusting in Luton". Luton Town F.C. 13 March 2014. Retrieved 14 March 2014. 1 2 "Rivalry uncovered" (PDF). Football Fans Census. December 2003. Retrieved 3 April 2009. ↑ "Motorway madness". When Saturday Comes. November 2005. Retrieved 3 April 2009. ↑ "Herts rule Beds". When Saturday Comes. March 2002. Retrieved 3 April 2009. ↑ "Luton Town Official Matchday Programme". Talk of the Town. Luton Town F.C. 11 August 2009. ↑ "Harry Hatter is Kidnapped". Luton Town F.C. Retrieved 8 May 2009. ↑ "The Eric Morecambe Trophy". Morecambe F.C. 27 November 2014. Retrieved 11 December 2014. 1 2 Bailey (1997). The Definitive Luton Town F.C. pp. 6, 97. ↑ Collings (1985). The Luton Town Story 1885–1985. pp. 196–197. ↑ Bailey (1997). The Definitive Luton Town F.C. pp. 6, 90–91, 97, 99–100. ↑ Hayes (2002). Completely Top Hatters!. p. 111. ↑ Collings (1985). The Luton Town Story 1885–1985. pp. 205, 312–313, 315–317. ↑ "Steve Howard". Soccerbase. Centurycomm. Retrieved 29 May 2009. ↑ "Mal Donaghy". Fédération Internationale de Football Association. Retrieved 13 May 2009. ↑ "Finland 0 – England 8". England Stats. Retrieved 10 June 2009. ↑ Bailey (1997). The Definitive Luton Town F.C. p. 91. 1 2 3 4 "Luton Town all time records". Soccerbase. Centurycomm. Retrieved 6 April 2009. ↑ Bailey (1997). The Definitive Luton Town F.C. p. 46. ↑ Bailey (1997). The Definitive Luton Town F.C. p. 43. ↑ "West Brom snap up defender Davies". BBC. 1 September 2005. Retrieved 6 April 2009. ↑ May, Jamie (30 August 2016). "Hatters youngsters take their chance as Gillingham are beaten in Checkatrade Trophy". Luton Today. Johnston Publishing Ltd. Retrieved 1 September 2016. ↑ "Luton Town FC Player Profiles". Luton Town F.C. Retrieved 2 December 2016. ↑ "Hatters to take part in Development League". Luton Today. Johnston Publishing. 11 June 2014. Retrieved 30 June 2014. ↑ "Luton Town Under-18's". Luton Town F.C. Retrieved 27 December 2013. ↑ "Luton Town Youth Development". Luton Town F.C. Youth Development. Retrieved 27 December 2013. ↑ "Who's who at Luton Town". Luton Town F.C. 17 August 2013. Retrieved 29 January 2016. ↑ "Manager History for Luton Town". Soccerbase. Centurycomm. Retrieved 11 May 2015. ↑ Bailey (1997). The Definitive Luton Town F.C. pp. 19–101. ↑ Collings (1985). The Luton Town Story 1885–1985. pp. 244–245. ↑ "Luton Town Results/Matches 2013–14". Soccerbase. Centurycomm. Retrieved 11 May 2015. ↑ "Luton Town Results/Matches 2013–14". Soccerbase. Centurycomm. Retrieved 19 May 2014. Bailey, Steve (December 1997). The Definitive Luton Town F.C. Nottingham: Soccerdata. ISBN 1-899468-10-2. Collings, Timothy (1985). The Luton Town Story 1885–1985. Luton: Luton Town F.C. ISBN 0-9510679-0-7. Hayes, Dean P. (November 2002). Completely Top Hatters!. Dunstable: The Book Castle. ISBN 1-903747-27-9. Wikimedia Commons has media related to Luton Town F.C..